TORONTO (TICKER) -- Fernando Gonzalez played admirably but ultimately was unable to stop Roger Federer from reaching yet another tournament final. The world's top player, Federer reached the final of the Rogers Cup on Saturday with a difficult 6-1, 5-7, 6-3 triumph over Gonzalez, the 15th seed from Chile. Federer, who improved to 7-0 lifetime against Gonzalez, has reached 17 straight tournament finals - one shy of Ivan Lendl's ATP Tour record. 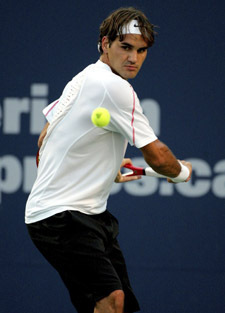 He has won 53 consecutive North American hardcourt matches and 17 straight overall. But it did not come easily for Federer, who has looked far from dominant this week. After storming through the opening set, he failed to convert several break points early in the second set and Gonzalez - who won Olympic gold in doubles in Athens two years ago - broke him at love in the 12th game to force a decisive set. Federer saved a break point at 1-2 in the third set, then broke Gonzalez in the seventh game when the Chilean sent a defensive lob long. Two games later, he closed out the match with another break to improve to 61-4 on the year - 60-0 against all opponents but nemesis Rafael Nadal. On Sunday, the Swiss superstar will face Richard Gasquet, who defeated fellow rising star Andy Murray, 6-2, 7-5, in the first semifinal at the $2.45 million U.S. Open warmup event. A 20-year-old Frenchman, Gasquet began his season a disappointing 7-13 but is 15-2 in his last five events, winning a grasscourt title at Nottingham, England, and a claycourt one at Gstaad, Switzerland. Murray, 19, slipped to 8-2 under new coach Brad Gilbert. The Brit, who was broken three times in the first set and in the final game of the match, had reached the final at Washington last week. Murray got only 48 percent of his first serves in and had 24 unforced errors to 24 winners. 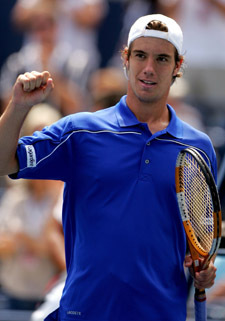 Gasquet, by contrast, served 67 percent and had 30 winners to 18 unforced errors. Still, there are plenty of positives for Murray to take away from Toronto, not least the increasing poise he showed in beating David Ferrer, Tim Henman, Carlos Moya and Jarkko Nieminen in consecutive rounds. Very close to breaking into the world's top 20 as a result, he must now turn his attention to facing Henman again next week in the first round in Cincinnati. "I think I showed that I can have two very good weeks on the tour back-to-back," Murray said before flying back to the States. "I played well all week." Gasquet won his first meeting with Federer in last year's Monaco quarterfinals but has lost all four encounters since, including a 6-3, 6-2, 6-2 setback in the first round at Wimbledon.